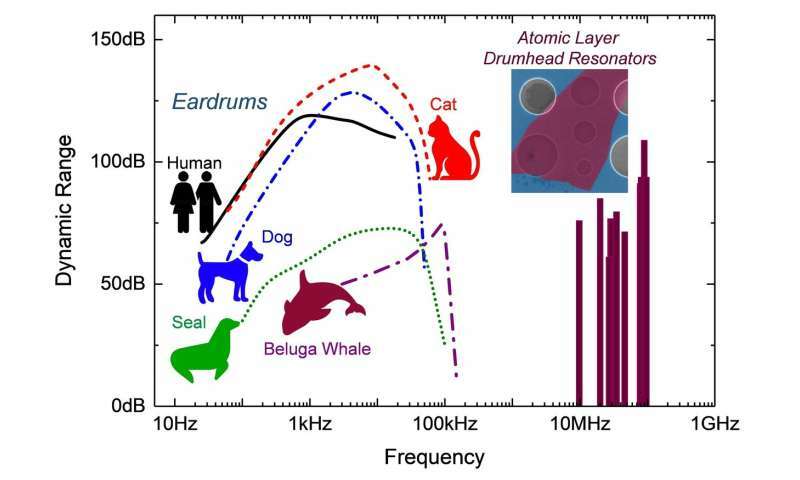 Researchers at Case Western Reserve University are developing atomically thin "drumheads" able to receive and transmit signals across a radio frequency range far greater than what we can hear with the human ear. But the drumhead is tens of trillions times (10 followed by 13 zeros) smaller in volume and 100,000 times thinner than the human eardrum. 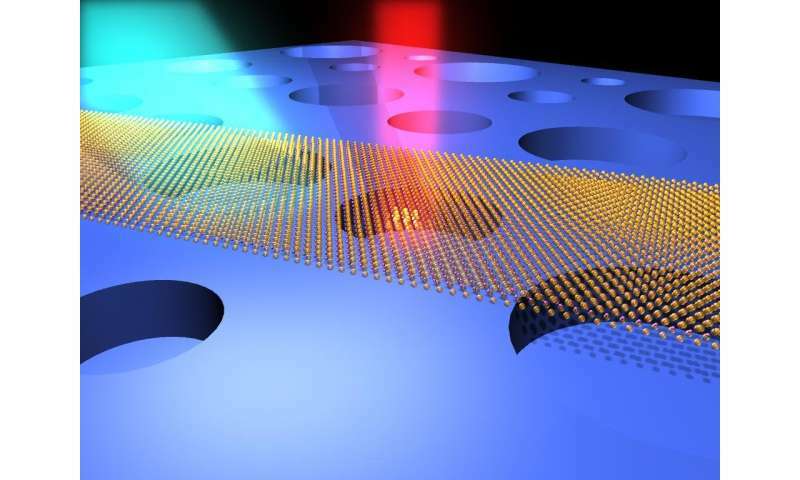 The advances will likely contribute to making the next generation of ultralow-power communications and sensory devices smaller and with greater detection and tuning ranges. "Sensing and communication are key to a connected world," said Philip Feng, an associate professor of electrical engineering and computer science and corresponding author on a paper about the work published March 30 in the journal Science Advances. "In recent decades, we have been connected with highly miniaturized devices and systems, and we have been pursuing ever-shrinking sizes for those devices." The challenge with miniaturization: Also achieving a broader dynamic range of detection, for small signals, such as sound, vibration, and radio waves. "In the end, we need transducers that can handle signals without losing or compromising information at both the 'signal ceiling' (the highest level of an undistorted signal) and the 'noise floor' (the lowest detectable level)," Feng said. While this work was not geared toward specific devices currently on the market, researchers said, it was focused on measurements, limits and scaling which would be important for essentially all transducers. Those transducers may be developed over the next decade, but for now, Feng and his team have already demonstrated the capability of their key components-the atomic layer drumheads or resonators-at the smallest scale yet. The work represents the highest reported dynamic range for vibrating transducers of their type. To date, that range had only been attained by much larger transducers operating at much lower frequencies-like the human eardrum, for example. "What we've done here is to show that some ultimately miniaturized, atomically thin electromechanical drumhead resonators can offer remarkably broad dynamic range, up to ~110dB, at radio frequencies (RF) up to over 120MHz," Feng said. "These dynamic ranges at RF are comparable to the broad dynamic range of human hearing capability in the audio bands." Feng said the key to all sensory systems-from naturally occurring sensory functions in animals to sophisticated devices in engineering-is that desired dynamic range. Dynamic range is the ratio between the signal ceiling over the noise floor and is usually measured in decibels (dB). Human eardrums normally have dynamic range of about 60 to 100dB in the range of 10Hz to 10kHz, and our hearing quickly decreases outside this frequency range. Other animals, such as the common house cat or beluga whale (see illustration), can have comparable or even wider dynamic ranges in higher frequency bands. The vibrating nanoscale drumheads developed by Feng and his team are made of atomic layers of semiconductor crystals (single-, bi-, tri-, and four-layer MoS2 flakes, with thickness of 0.7, 1.4, 2.1, and 2.8 nanometers), with diameters only about 1 micron. 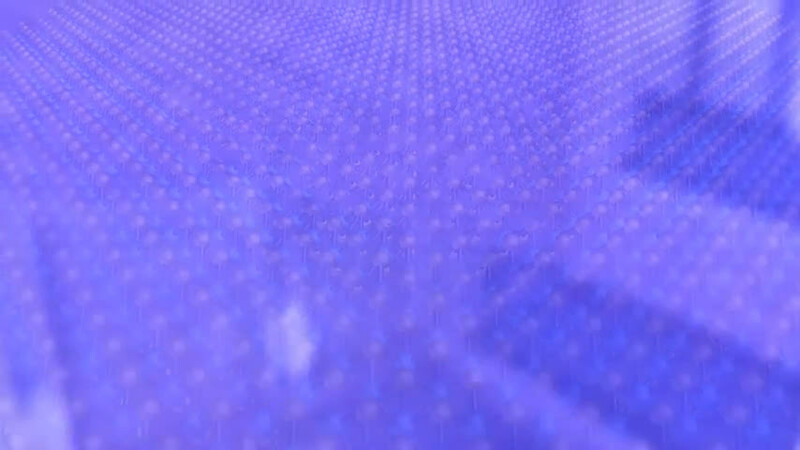 They construct them by exfoliating individual atomic layers from the bulk semiconductor crystal and using a combination of nanofabrication and micromanipulation techniques to suspend the atomic layers over micro-cavities pre-defined on a silicon wafer, and then making electrical contacts to the devices. Further, these atomically thin RF resonators being tested at Case Western Reserve show excellent frequency "tunability," meaning their tones can be manipulated by stretching the drumhead membranes using electrostatic forces, similar to the sound tuning in much larger musical instruments in an orchestra, Feng said. The study also reveals that these incredibly small drumheads only need picoWatt (pW, 10^-12 Watt) up to nanoWatt (nW, 10^-9 Watt) level of RF power to sustain their high frequency oscillations. "Not only having surprisingly large dynamic range with such tiny volume and mass, they are also energy-efficient and very 'quiet' devices", Feng said, "We 'listen' to them very carefully and 'talk' to them very gently."